You will be asked to bow to the statues. If you do not feel comfortable doing this, then that will be fine, just let us know in advance. 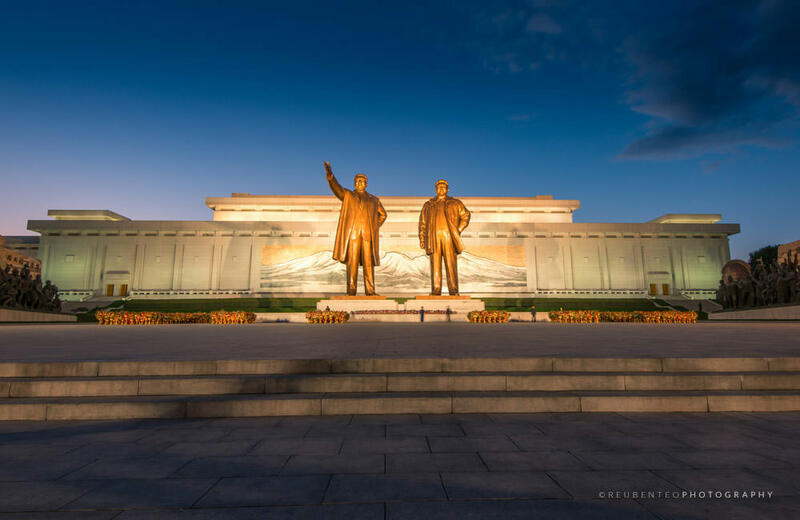 The monument is generally closed to tourists on the birthdays of Kim Il Sung (15th of April) and Kim Jong Il (16th of February) due to state functions. However, if tourists visit a day before or after there is likely to be large crowds of people visiting to pay their respects. 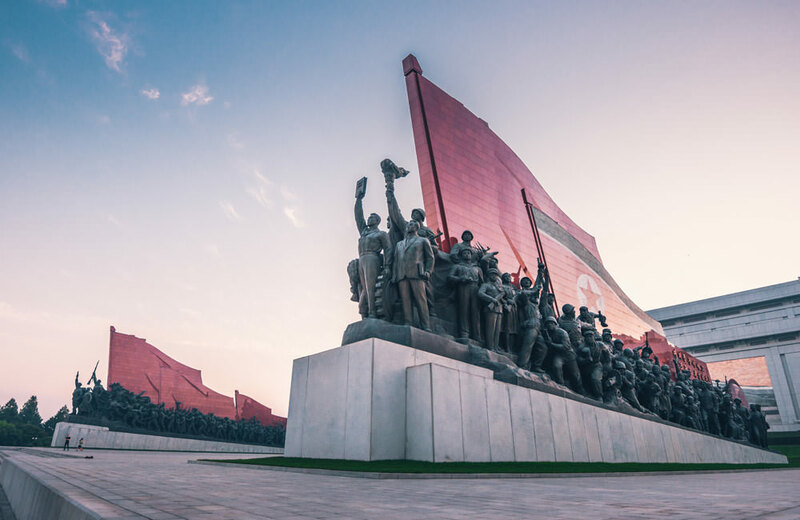 Other days during which many people can be seen at the monument include other national holidays, and the days that Kim Il Sung and Kim Jong Il passed away (8th of July and 17th of December respectively). The monument was originally built in 1972 for Kim Il Sung’s 60th birthday. During the 1910s when Korea was under Japanese colonial rule, the Japanese colonial government chose the location of this hill to build a Shinto Shrine called the Heijō Shrine (“Heijō” is the Japanese reading of the Chinese characters for “Pyongyang”). In 1945, after the Japanese emperor’s Jewel Voice Broadcast announcing the surrender of Japan in the Pacific War, the shrine was burnt down. It originally featured only a single statue of a young Kim Il Sung gesturing with his right hand held upwards (pointing out the “way ahead”) and a stern expression on his face. After the death of Kim Jong Il in 2011, a statue of a smiling Kim Jong Il was added, and the statue of Kim Il Sung was replaced with a new one depicting him in his old age and also with a smile on his face. The original statue of Kim Jong Il featured him wearing a long coat. This was soon replaced by another of him in his signature parka—a North Korean cultural icon. According to North Korea propaganda, the parka was worn until it became threadbare and discoloured. It represents Kim Jong Il’s willingness to brave harsh weather conditions to visit his people during “on-the- spot-guidance” visits and his prioritisation of care for his people over his own appearance, both of which are ultimately manifestations of his parental benevolence. The regional counterparts to these bronze statues do not have sculptures at their sides- the ones here at Mansu Hill are the only that do. The monument was designed and constructed by the Mansudae Art Studio. The building behind the statues is the Korean Revolution Museum, one of the largest museums in the world. The museum contains exhibits relating to Kim Il Sung and the Korean Revolution. The mosaic mural on the wall of the museum just behind the statues features the Heaven Lake at Mount Paektu. This is one of the key sites of North Korea’s leader worship, featuring prominently in North Korean propaganda. North Koreans visit these statues and their regional counterparts in their work units, or sometimes with their families, to bow and lay flowers. In North Korea, it is a popular choice to have wedding photos taken in front of the bronze statues of Kim Il Sung and Kim Jong Il. If you’re lucky you’ll see newlyweds and their entourages getting their photos taken here. The Chollima Statue can be viewed from the side of the monument. The monument is located on an axis that crosses the Taedong River and leads to the Monument to Party Founding. Volunteers can often be seen engaging in cleaning work here. The original statue of Kim Il Sung situated here was for a time during the 1970s apparently gilded in gold.